"Make this apple-pumpkin-banana smoothie with yogurt for breakfast, or with ice cream for dessert-or for a sweet midnight snack! Substitute vanilla ice cream for the yogurt, if you prefer." 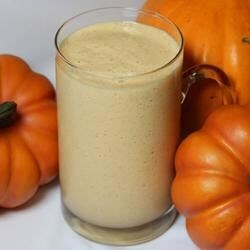 Combine the yogurt, pumpkin pie filling, banana, apple juice, cinnamon, and nutmeg in a blender. Blend until smooth, about 1 minute. Pour into glasses and serve. I made this today for my boys, using a pinch of apple pie spice, a little brown sugar and a frozen banana. They drank it up right smart. It was okay... I added some pumpkin pie spice, brown sugar and more yougurt and that improved it a bit. Way to sweet, won't be making again. Very good. I used apple cider and thought it was great. Good flavor, a bit on the thin side.